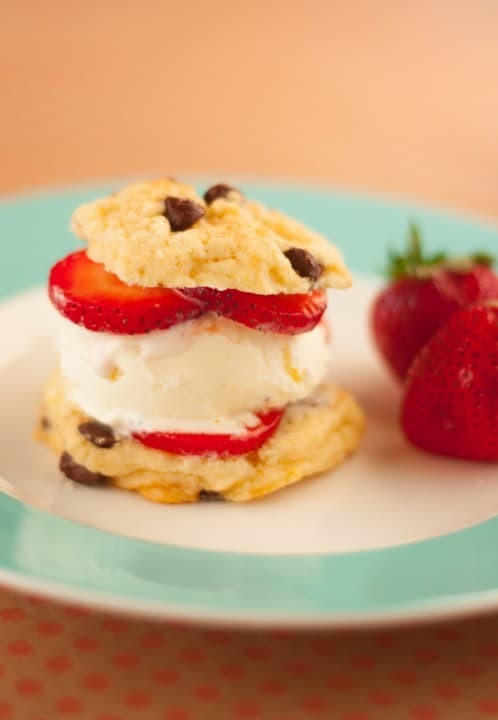 Easy Strawberry and Chocolate Chip Cookie Ice Cream Sandwich. 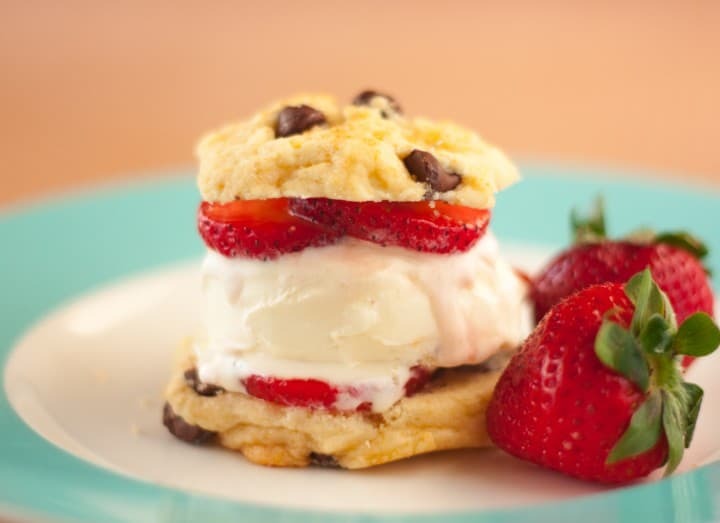 Soft, chewy homemade chocolate chip cookie with vanilla ice cream and fresh strawberry topping. Since starting food photography and this blog my cooking and eating habits have changed. I am now more aware of ingredients that I use and why they work in recipes. I am also more adventurous with my cooking, confidently changing ingredients to make the most flavorful dishes. The biggest change is once I’ve made the meal. With the scene and camera prepped it’s a mad dash to plate the food in a presentable and mouth-watering way, then photograph the dish from different angles, all while my girlfriend is often patiently waiting for us to share a normal meal together. If I get it right we can actually eat while it’s still warm, or frozen for the purposes of this recipe. It may sound crazy but I enjoy all of this. Hopefully you enjoy these recipes and can create some memories for yourself. Sometimes you have to go out of your way and do things you normally wouldn’t when creating a new project. I baked the cookies for this recipe towards the evening and was not able to photograph the sandwiches because of diminished natural light. I wanted to get this recipe photographed before my upcoming vacation and only had a few remaining evenings, which were almost fully booked. The next day I came straight home from work and made the ice cream sandwich to shoot in natural light. Of course I had to eat it real quick and decided to count that as dinner. Then I rushed off to tennis lessons for the rest of the evening. As far as the ice cream sandwiches, the ingredients and pictures should influence you enough to try this recipe. 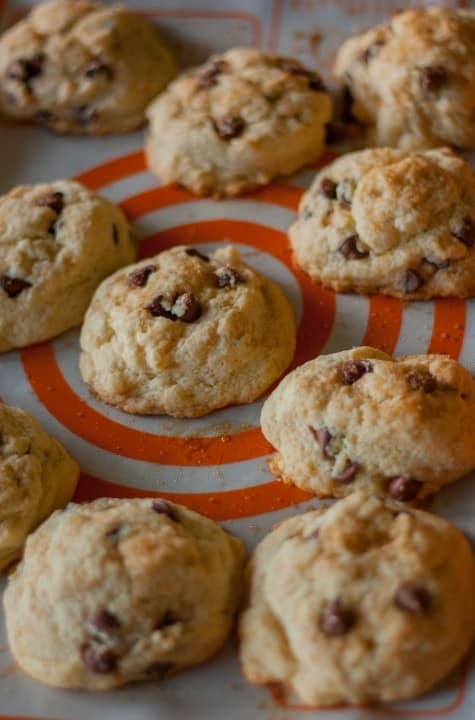 In case you need more persuasion, these chocolate chip cookies are more of soft biscuit textured shortbread. Bite into one and they will slowly dissolve in your mouth, along with your favorite ice cream of choice. It’s a simple yet decadent snack that you can enjoy outside on a warm day or cozied up on a couch in front of your favorite movie. Enjoying homemade cookie ice cream sandwiches can be a bit messy. By the time you make them and are ready to eat, they can be a bit runny. Believe me, I found this out the hard way when trying to photograph this recipe. A couple tips to help. For one make sure the cookie is completely cooled before assembly; you can ever refrigerate them before. Once assembled with ice cream in the center, put them in the freezer for at least 30 minutes. This we re-set the ice cream and make them easier to enjoy. I shot this in fading natural evening light at 1/100 sec, f/ 1.8, ISO 400 . Photographing a frozen dish was a new experience for me. A swear there was some invisible heater right next to the ice cream sandwich quickly melting it into a dripping mess. Fine for eating but not too appealing in a photograph. My apartment wasn’t too hot either. I had the background ready and camera set to the proper settings, and only took a few minutes to shoot once I placed the propped sandwich. It started to melt even in that amount of time. I’d suggest setting your freezer extra cold and making sure whatever you are photographing is frozen hard. Next time I would create the sandwich and place it back in the freezer to set again before doing the photography. Hopefully this will give me a few more precious minutes. Flavor profiles: Sweet and just slightly salty. Paired with rich ice cream and crisp strawberry topping. Texture: Soft, chewy cookie with cool and creamy ice cream. Dietary Options/Substitutions: This recipe is vegetarian. Use vegan ice cream and/or gluten-free cookies/flour for GF. You can replace strawberries any fruit. Combine strawberries, sugar and vanilla in medium bowl. Refrigerate until cookies finish baking and are ready to assemble. In a large bowl combine flour, granulated sugar, baking powder and salt. In a separate small bowl combine cream and ½ cup melted butter. Add to dry ingredients and stir until batter forms. Then stir in chocolate chips. Drop 1/3 cup mounds onto greased baking sheet about 2 inches apart. Brush with remaining melted butter and sprinkle with Sucanat sugar. Bake 18-20 minutes at 375º until golden brown. Remove and place on wire racks to cool completely. Cut cookies in half horizontally (or you can use 2 whole cookies to make a thicker ice cream sandwich). 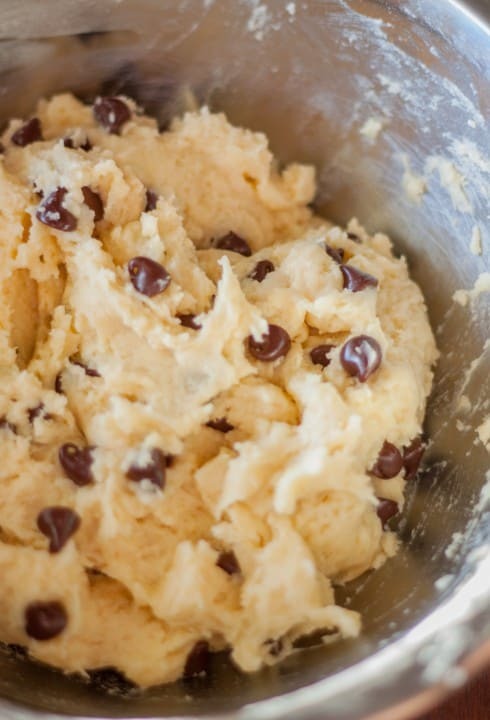 Place desired amount of vanilla ice cream on one half of each cookie (you can form ice cream into a ¼ cup measuring cup first to shape for sandwich). Spoon strawberry mixture on top of ice cream and top with other half of cookies. Serve immediately. Note: Recipe adapted from Taste Home: Recipe Card Collection: Spring 2014. Print. I shockingly have never made ice cream sandwiches before.. think I have been missing out on something seriously delicious. These look great! Thanks Thalia! You have been missing out, but it’s never too late to try. You can technically make them with any cookie and any ice cream, that’s the fun part.